This Wednesday, June 20th, is the date for this year’s Newburn River Run, hosted by Elswick Harriers. 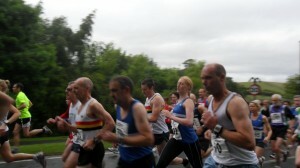 This is a 6.5 mile race, setting off from Newburn Leisure Centre, and runs adjacent to the River Tyne towards Wylam. After approximately 3 miles the race crosses the river and returns back towards Newburn along the South side of the Tyne. At about 6 miles the route then crosses the river for a second time before a mad dash back to the Leisure Centre. The race is mainly on flat trail paths, and for those keen on their local history, passes the birthplace of George Stephenson. 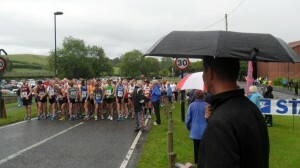 Starting line of 2011 Newburn River Run. Who would have believed that it is a full year since our sole club representive, Chris Meek, ran this race last time out. Doesn’t time fly! 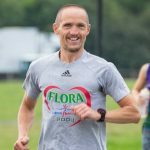 Just like Chris did last year when he ran his socks and shoes off at the Newburn – literally (click here to find out how). Chris Meek (r) in action. One of TBH’s top Vets, Keith Smith, has already entered this race and will be looking to continue his terrific form to pick up the ‘Jimmy Bell Trophy’ which is awarded to the fastest V40 runner on the night. However, Les Smith from Heaton may have something to say about that ! Trophies will also be awarded to the winner of the Womens and Mens race with Start fitness vouchers being awarded to all other prize winners. I will be going over on Wednesday to support and write a report about this race, so I have a couple of seats in the car for whoever would like to run. Registration, race start and finish are at Newburn Leisure Centre. There were about 80 places left at the time of writing and Frank Watson (Elswick Harriers Race organisor) says its okay to ring him on 07940482180 with any queries.